why hire an NWFA pro? NWFA represents more than 25,000 professionals worldwide, so finding one in your area is easy. NWFA members have access to industry standards, training programs, and skills certifications that validate their professional expertise. 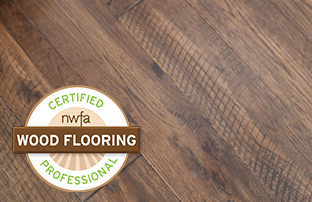 The NWFA also maintains a Certification Program that was developed to recognize and promote the competence of wood flooring professionals throughout the industry. Industry professionals undergo both online and hands-on testing to earn their certifications. NWFA Certified Professionals set themselves apart from their competition by attending training and earning certifications through the NWFA. Certification validates industry knowledge and expertise and recognizes individuals as experts in their field. "NWFA Certified Professionals is different from other certifying bodies. Its testing is rigorous, and its continuing education requirement means our crew is familiar with new industry technologies. NWFA Certification validates our crew's commitment to investing in their skills and knowledge." – Steve Brattin, Owner of SVB Wood Floor Service in Kansas City, Missouri. Search wood flooring professionals including installers, sand and finishers, retailers, and inspectors. Those who have completed higher levels of training are ranked higher on the search engine. Search for an NWFA Certified Professional in your area who can help you choose the floor that best suits your lifestyle and install them in your home. Search for a Contractor member in your area. Search for a Dealer/Retailer member in your area. A dealer/retailer can help you specify which floor is best for your home. Search for an NWFA Certified Wood Flooring Inspector in your area. If you are experiencing problems with your wood floors, an inspector will investigate the issue and discover the cause.